You don’t have to use your best marijuana to make your best marijuana brownie. You’ll want the best ingredients such as chocolate, and flower for the actual recipe. But you can get very precious THC out of the shwagest plant on earth – and if you harvest enough THC from the shwag – you’ll end up with the kindest brownies on the block. If you know someone who chooses to vaporize their marijuana rather then smoking it –you’ll find their spent weed is your gold mine for THC. When vaporizing weed – the user is only taking the “skimming the cream from the top” of the plant. There is a gold mine of THC that is not evaporated and is suspended in their spent weed. If they are throwing it away – it’s worth asking for it. Vaped weed is already well ground. You don’t have to remove your stems or seeds from your mixture. Leave them in and you’ll extract from that which you cannot smoke. The whole plant is abundant source of THC, but there are only a few pleasant ways to using it. Just make sure your choice of marijuana is well ground. This will insure your marijuana brownie will have all the THC you can harvest. The marijuana plant smells awesome! The marijuana plant does not taste good. You should not leave the plant in the oil or butter. You should strain your vehicle (cannaoil or cannabutter) before adding it to your recipe. Once may not be enough. You should strain it until your vehicle is its’ original color with no plant matter in it – at all. Insuring you remove all plant matter will also make your final product taste nothing like marijuana. If your marijuana brownies are not brown, you missed this very important key. The easiest way to extract the THC from marijuana is using oil. Most articles refer to cannabutter as the best way. It is not for first timers. Butter usually has more in it then butter. These must be removed. Most in-the-box recipes call for oil not butter. Butter will “keep” in the fridge, but oil will “keep” longer. Butter is for taste, oil aids in cooking. Keep your oil/marijuana mixture on heat for at least 10 minutes. You can leave it on as long as you want. But it is critical that you keep the temperature around 100 F. It really doesn’t take that much heat to get the THC to make the jump from the plant to the oil. And if you burn your mixture – you’ll taste it in the brownie. 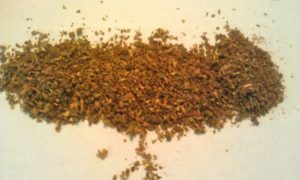 Most weed brownie recipes call for ¼ to ½ ounce of kind weed. You’ll need to adjust this to match the potency of your ingredients, and the head of the connoisseur. A true head will prefer their brownies with ½ to ¾ ounce of weed. If you use vape weed – you should use about the same weight as what recipes call for. You’ll find your high from vape weed heavy, and couch-lock. Using the shwag you might use a whole ounce, changing out and adding new mixture to your oil every 30 minutes.